We all want a toned, flat stomach. No surprise there. But since many women are still relying on crunches to get it, we want to make one thing clear: Crunching is not the most effective abs workout. "Crunches work only the muscles on the front and sides of your abdomen, but it's important to target all the muscles of the core to get more defined abs—including lower back, hips, and upper thighs," says Lou Schuler, co-author of The New Rules of Lifting for Abs. To lose belly fat and uncover amazing abs, Schuler recommends a series of core stabilization exercises based on a training program devised by co-author and personal trainer Alwyn Cosgrove. "Core exercises like the plank help train muscles to stabilize the spine and pelvis so you can avoid back pain and improve posture, Schuler says. "They also burn more calories than crunches because they work more muscles." Related: For a flat belly and toned bikini body, check out The Bikini Body Diet by SHAPEeditor-in-chief Tara Kraft. Trade crunches for these three super-effective abs exercises from The New Rules of Lifting for Abs and you’ll be on your way to a perfectly toned, flatter tummy. Why it works: This abs exercise is more challenging than a traditional plank because you're supporting your entire body weight on two points of contact instead of four. As a result, you must work your core harder to stay stabilized. A. Lie on your left side with your elbow directly beneath your shoulder and legs stacked. Place your right hand on your left shoulder or on your right hip. B. Brace your abs and lift your hips off the floor until you're balancing on your forearm and feet so that your body forms a diagonal line. Hold for 30 to 45 seconds. If you can’t hold that long, stay up as long as you can and then repeat until you’ve held for 30 seconds total. Switch sides and repeat. 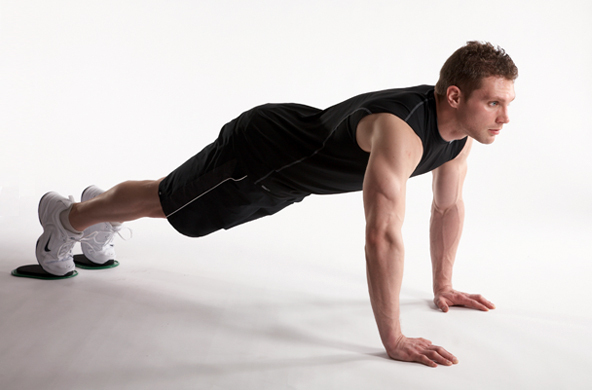 More great stabilization moves: The standard plank and the anti-rotation hold. Why it works: This abs exercise uses your entire core to keep your body stabilized and burns additional calories by adding movement (dragging yourself along the floor). It mixes cardio, stability, and strength training to get you fast results. A. Find a stretch of floor that allows you to go forward 10 to 20 yards, and grab anything that will slide over the surface with minimal friction. Dinner plates or plastic bags work on a carpeted floor, while towels work on wood or tile. B. Start in pushup position with your feet on the slides, towels, or plates. C. Walk yourself forward with your hands to the end of your runway (aim for at least 10 yards). Rest for 60 to 90 seconds (or as long as you need to recover) and repeat the alligator walk back to where you started. That’s one set. Repeat one more time.